This new campaign by Parkinson’s UK gives people like me hope. A cure would stop me fearing the future – I won’t let customers wait for pizza, so why am I waiting for a cure? Domino’s Pizza stores across the UK took part in ‘Pizza for Parkinson’s Day’ which pledged 5p from every pizza sold to Parkinson’s UK. The fundraising idea was developed by John Shedden, the owner of Full House Restaurants Holdings Ltd, a franchise of 43 Domino’s Pizza stores, who was diagnosed with Parkinson’s in 2016, aged 69. Full House’s fundraising team aims to raise £100,000 for the Parkinson’s UK research campaign, ‘We Won’t Wait’. 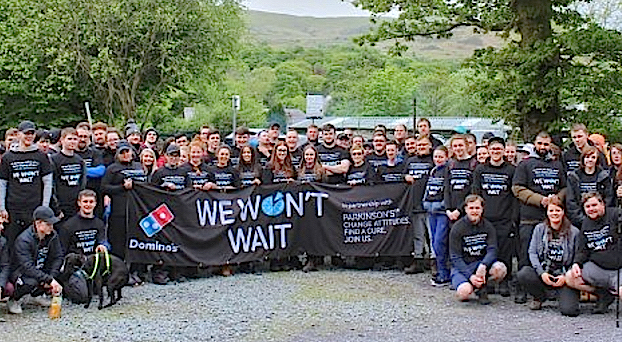 In addition to the ‘Pizza for Parkinson’s Day’ – which raised over £9,000 from the sale of 188,000 pizzas – 83 members of Domino’s Pizza staff raised £14,000 by trekking up Mount Snowdon in May. To coincide with World Parkinson’s Day 2017, Parkinson’s UK launched ‘We Won’t Wait’, an initiative highlighting the lack of progress since the condition was discovered 200 years ago. The campaign followed on from the charity’s international campaign to raise awareness, #uniteforparkinsons.